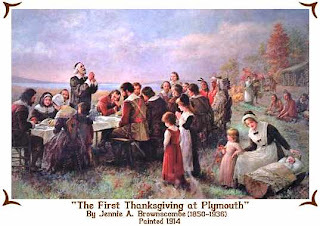 When we sit down for Thanksgiving dinner tomorrow, I hope you will all join me in expressing our thanks in full recognition of all the blessings we have here in this country. Enjoy yourselves. Hopefully, you can enjoy this special time with family or friends. Not everyone will be fortunate enough to do so. Please give thanks and pray for all our men and women in the armed forces, but particularly for those who are away from their families and friends, and who may be in harms way, such as in Iraq and Afghanistan. And don't forget to pray for those families who have lost loved ones in the line of duty - they really deserve our prayers and gratitude.